On 28 May, a group of artists from Miami began a petition to support the Alliance française. 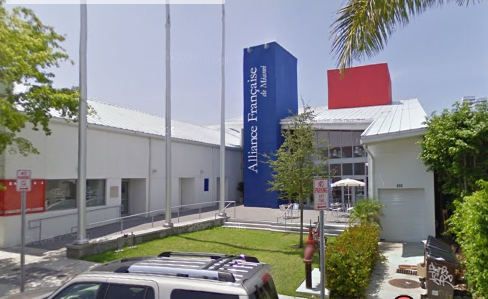 The AF, in Miami since 1967, may have to leave the building where it was moved to in 2007, on Calle Ocho. Rumors of financial problems have been circulating around the Alliance française de Miami (AFM). The petition launched on Saturday by a group of artists confirmed these doubts. The non-profit association may have to leave its building due to difficulties in paying the rent. Previously located in Coral Gable, the AF moved to Calle Ocho (nicknamed Little Cube) in 2007...land acquisition and construction cost a total of $5.6 million, which was to be assured through a contribution of $2 million, $600,000 of support from the French government, and a bank loan of $3.6 million from Mercantil Commercebank. At the time the loan was to be repaid by funds generated by a restaurant, bookstore, hairdresser, cognac seller, travel agent and Italian Cultural Centre which had leased an area in the building. ...then along came the housing crisis, tenants wanted to leave, in short the project at creating a little village did not succeed and the association needs funds to survive. The article also states that the Consulate General of France in Miami has reiterated its support for the AF, and it will organize National Day celebrations there on 14 July. Not sure if this is exactly what it means by support, or whether it intends to directly obtain funds. Anybody know more about this? As always I have little time to write on the weekday so I can't get into the subject in much depth.